Restorative Gentle Yoga to open up, relax, release brain stress in postures. While doing this, we send a massage therapist around to help open up muscles that are holding back tightness and build up. Its basically the best blissful class we could design for total body release/renewal. Come ten minutes early in comfortable clothes and re-new YOU! Experienced teacher using Yoga for Grief Intervention. Patty has an M. A. in Ministry from Ursuline College and a B.A. in Communications from Ohio Wesleyan University. She is certified through the T.R.Y. for Life Yoga School in Cleveland, Ohio. She has been teaching for eight years and continues to learn from experienced teachers in the area and around the country. (postures) and ends with a beautiful Savasana. Props and modifications may be used to enhance and support your practice. with Doug Keller, and Judith Lasater. Anne is also a certified restorative yoga teacher and Reiki Master. 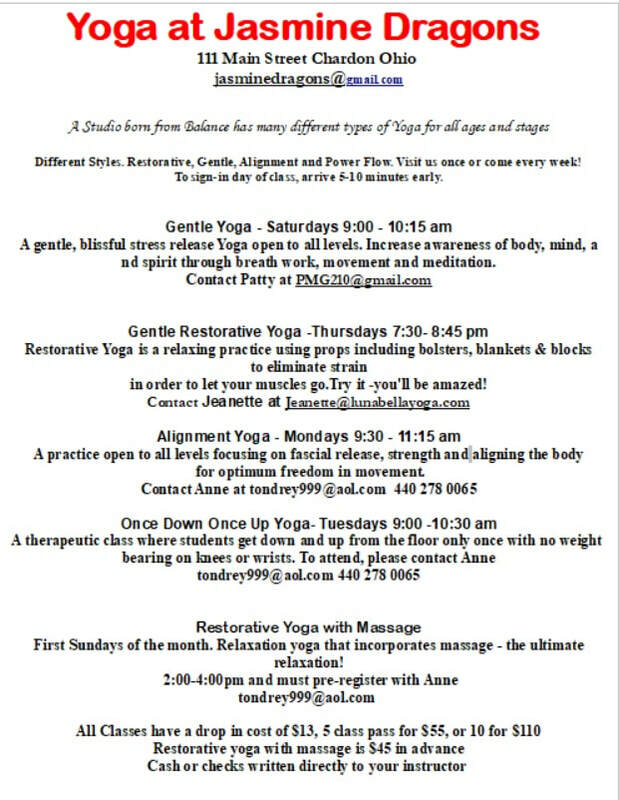 Anne'sclasses are open to all levels and focus on aligning your body. breathing, simple meditation and relaxation for relief from the stress of our hectic and chaotic world. Classes are alignment yoga which can be slow moving and, as one of my teachers says, "strangely exhausting!" I ask students to bring a great deal of attention to small and distinct movements and to their unique anatomical structure. This work involves identifying our "blind spots" so we're not moving in the same old patterns that often create both muscle imbalances and pain over time. Asking Anne : What is your goal for students who attend your class? I have two goals: that my students be functional in their bodies for as long as they are in them! Also, that my students take responsibility for their own well being and understand that ultimately each of us is responsible for our own well being. 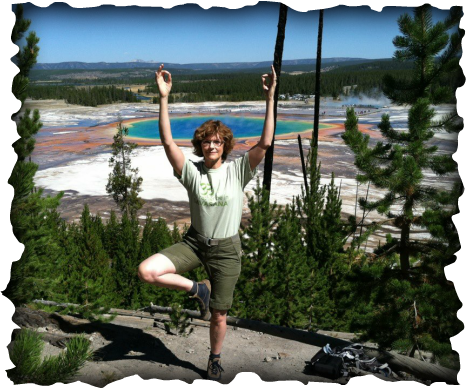 I am Jeanette Peters, a Certified Yoga Teacher at the 500 hour level by the Yoga Alliance. My eyes were opened to yoga in high school after the death of my father. At that time in my life I was looking for a way accept a new change in my life and my heart found peace by doing yoga. I have to admit that I was content just attending yoga classes and doing videos by myself, however, the universe had a different direction for me. The road I have been traveling down has not been easy and at times I have felt like I was never going to experience this absolute bliss and peacefulness that I have learned so much about. Through the trusting guidance of my teachers I have realized that learning anything new takes time and patience. Yoga isn’t just about a physical posture (asana) it’s about learning how to accept the things you cannot change and embracing the difficult things in your life with an open heart. When you come to one of my classes you can expect to hear a lot of talk about the heart! Opening up to gratitude and love are something that I struggle with, and I have learned throughout the years that a lot of people feel the same way. I like to invite in the energies of the universe, so I use the seasons and celestial events to help open up a receptive space inside of the students. We do mudras and breath work and every class is different depending on what the students need in their life.